Past few months Facebook was testing a new registration social plugin and just recently they have officially announced this feature. For detail, you can access the documentation directly here . After play a while with its API documentation, I think the concept it is definitely interesting. However one piece thing that I think this plugin still missing would be a field type to support Password field. Anyway to make all this short, for Joomla website owner, you can now integrate this new Facebook social plugin feature to your Joomla website with Facebook User Registration Form , a commercial Joomla component from our partner website, TwitHut . 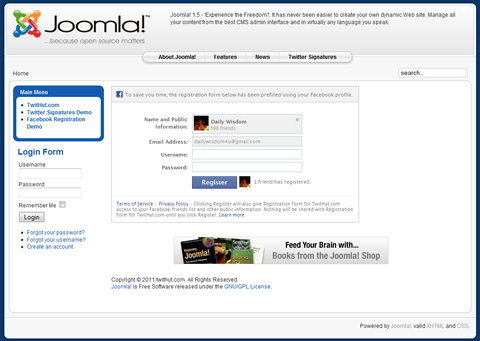 Joomla Facebook User Registration Form is a Joomla 1.5 Component that allows users to easily sign up during user registration for your website with their Facebook account. If you have been using Twitter to reach your friends and followers by posting tweets (twits), you may have heard and use Twitter badge before (either in a form of customised HTML code for your website or specifically built for Joomla module, Wordpress & Blogger widget etc) which displays your last posted tweets and other attributes from your Twitter. Nowadays Twitter users seem like starting to use Twitter Signature image and button to display their last posted tweets or total friends, total followers etc in a generated image. You will be able to find easily there are many websites provides this for their visitors. One of our partner that tries to provide something more special than the rest to generate free Twitter signatures is TwitHut. TwitHut provides you with variety of cool image styles to use and you can use generated HTML code to attach on online forums, emails and websites. Of course, the main purpose is to increase directly your Twitter profile and indirectly your website and on top of that, with their premium service you can even generate income with your own ad and other benefits .